And after his winning against Falla, Federer also played doubles with his partner Marco Chiudinelli and the lost to Begemann/ Knowle 1-6, 7-5, 12-10, in dramatic fashion, saving all four championship points in the Match Tie-break. Begemann:"I'm thrilled..A childhood dream come true. Twelve years ago I went to school in Halle. I lived here for two or three years, played for the club. With my mom passing a few years ago, I dedicate this title to her. This is such a special moment for me." Knowle: "It was a great week for us, it's very special to play Roger and to beat him in a final. I really enjoyed playing with Andre and we got our first title together in our first tournament." Thanks guys for all the input. Good thing he did play doubles as only 3 singles matches is not enough to get sharp on grass, and I think he still lacks some sharpness. But I don't know like you guys, but I think that right now there's just one thing on Roger's mind (besides family): getting HIS wimbledon championship back. He stated before the grass court season that he needs to prove himself, and yesterday he said he's in this gig for the titles, so it's pretty much clear to me what kind of mindset he has heading to Wimbledon. 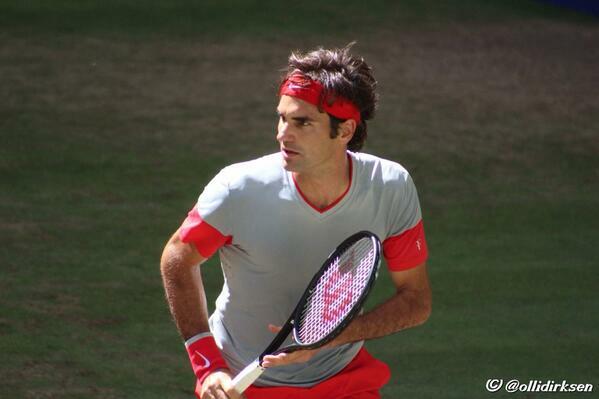 My prediction: we will have the repeat of 2012 final, hopefully with equally awesome performance from Roger. Allez! On the bright side, I remember wonderful piece on the Wimbledon website, two years ago, after the final. Obviously many people were devastated (especially whining BBC commentators during the match...) after the loss, but Roger played so gracefully that everyone had to admit that it was glorious day for tennis. And so even they couldn't be really that negative about the outcome of the final, so the author of that article found a truly wonderful way to work around it, making the main thesis of that piece claim about the total failure of Roger Federer. Failure to play the villain in that spectacle I mean, how brilliant and yet so British was it? I loved it, it was a fun read. I shall never forget Nicolas Mahut having to apologise for beating Murray in the first round at Queens in 2012 ... the British media are something else!